Gastritis commonly refers to irritation or inflammation of the stomach lining. Diet can make this medical condition worse. Spicy and highly acidic foods increase the production of stomach acids, irritating the mucus lining of the stomach. If you suffer from gastritis, you should avoid eating foods like pickles, which can irritate your stomach. Although gastritis symptoms often improve with treatment and dietary changes, chronic gastritis can lead to more serious health issues. Acids in the stomach that help digest food can irritate or damage the stomach lining. When this happens, gastritis symptoms occur. Common symptoms of gastritis include loss of appetite, indigestion, bloating and abdominal pain. Other symptoms include vomiting and stomach cramps after eating. Gastritis can also cause constipation and diarrhea in some people. Avoid trigger foods and eat smaller, more frequent meals to reduce the amount of acid your stomach produces. The release of less acid helps to relieve pain and gives your stomach lining time to heal. Although any food or beverage you consume causes your stomach to secrete acid to aid in digestion, some foods cause the stomach to produce more acid, according to Joanne Larsen, a registered dietitian. If you are prone to stomach problems, avoid pickles and other irritating foods to prevent excess gastric acid production. In addition to acidic and spicy foods, alcohol and beverages containing caffeine increase the secretion of gastric acid, as do fried and fatty foods. With gastritis, restrict the amount of salt and salty foods in your diet. Salt can irritate the lining of your stomach. Most pickles have high sodium content. Avoid seasonings including garlic, cayenne and curry. Red peppers, hot chili peppers, sour foods and spices such as cinnamon and cloves can cause stomach upset as well. Sweet pickles, which have lower sodium content, are still highly acidic and therefore should be avoided. Eat foods that digest easily and cause your stomach to secrete less acid. Vegetables, fruits and whole grains high in fiber are smart food choices for gastritis, as are low or non-fat dairy products. Onions, salt, vinegar and spices are the basic ingredients for pickling cucumbers, and are also some of the foods that can irritate your stomach lining. In particular, vinegar has highly acidic properties. When pickling cucumbers, bacteria digest the sugar in the cucumbers during fermentation. 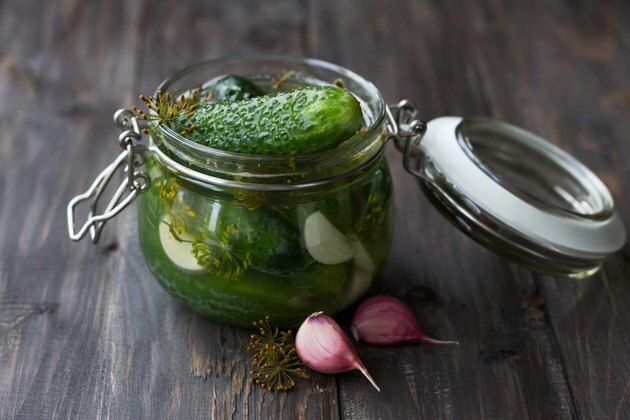 The production of lactic acid during this process is what gives pickles their sour taste. Although lactic acid actually kills harmful bacteria, including the H. pylori bacterium in the digestive tract, your doctor may prescribe antibiotics. Sometimes a combination of antibiotics is necessary to treat H. pylori infection -- a common cause of gastritis. Inflammation results when these bacteria irritate the mucus layer of the stomach lining. Are Onions Bad for Gastritis?